Each election cycle is unique. The 2016 presidential campaign was characterized on the Republican side by a very large field with no clear frontrunner in the early stages, while on Democratic side former Secretary of State Hillary Clinton was seen as almost inevitable. The campaign got off to a fairly quick start for Republicans, while on the Democrats' race was much quieter. Former Gov. Jeb Bush, who had been rather low-key in the pre-campaign, started things off with a Dec. 16, 2014 announcement that he would "actively explore the possibility of running for President of the United States" (+). For the first four months of 2015 the field consisted mostly of potential candidates using leadership PACs, 527 organizations, and 501(c)(4)s to conduct their activities. Hopefuls then started "throwing their hats into the ring" as testing the waters, exploratory or full fledged candidates (+). On March 23, 2015, Sen. Ted Cruz became the first major candidate to formally announce his candidacy. In April the floodgates opened a bit, with more Republican announcements and Hillary Clinton's long anticipated entry into the race on April 12. May and June saw the bulk of the candidate announcements. Also during this period a number of high-profile prospects ruled out White House runs. All in all, the timing of formal announcements in 2015 was fairly similar to what took place in 2011. Nascent campaigns set to work raising money, attracting talent, building organizations and staking out positions. This cycle an unprecedented parallel campaign also developed as ostensibly independent super PACs supporting the major candidates hired staff and raised millions of dollars. By the latter part of 2015, the campaigns were fully engaged. Advertising campaigns began. Seven Republican and four Democratic debates occurred before the first contest. Media attention increased Most resources focused primarily preparing for the Iowa caucuses and New Hampshire primary. Vital, but unglamorous work went on to get on state ballots and line up full delegate slates, so that if the candidate actually survives the early contests, he or she will not be knocked out by default in later states. As 2015 progressed the field became "tier-ized." Top-tier candidates get prominent coverage, while "the rest of the field" candidates face the challenge of not being taken quite as seriously and getting less coverage and less prominent coverage. The use of national poll numbers to determine which candidates would participate in debates drew sharp criticism from candidates who did not make the cut. Before the first votes were cast six Republicans and two Democrats ended their bids after failing to gain traction. In terms of timing, there are a number of reasons why a presidential prospect may want to put off becoming a candidate. From a strictly financial point of view, a later start can mean a less costly campaign. A full campaign is a grind, requiring long hours, extensive travel and incessant fundraising demands. Additionally, once a hopeful launches, he or she has to give up many activities and becomes subject to the reporting requirements of the FEC. This cycle, several of the sitting governers (Jindal, Christie and Walker) wanted to get through their budget processes before announcing. At the same time, there are reasons to get in sooner. Long-shot candidates often figure they will need more time to build up their campaigns. Additionally if a nomination race looks like it will be very competitive and there will be a crowded field, the impetus may be for candidates to announce earlier rather than later. Also affecting calculations are the dates of the first contests. In the 2008 and 2012 cycles, the Iowa caucuses were held on January 3, and on the Republican side the Iowa Straw Poll in August has loomed large as well. It appears the 2016 cycle will start a month later, with the Iowa caucuses on February 1. Individuals can take many steps en route to becoming candidates and announcing their candidacies. First they may use a variety of vehicles such as leadership PACs, 527 organizations, and 501(c)(4)s to conduct pre-campaign or one could say "pseudo-campaign" activities. For example former Gov. 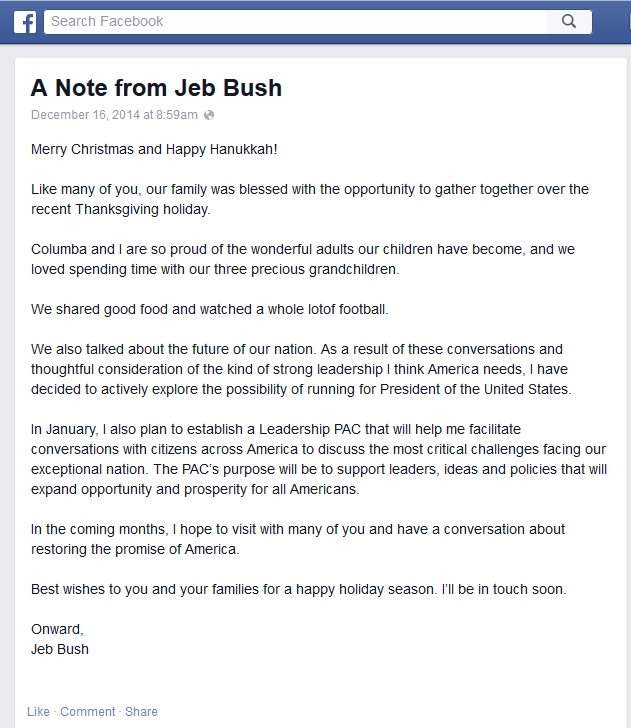 Jeb Bush's Dec. 16, 2014 announcement that he had "decided to actively explore the possibility of running for President of the United States" was not a formal step. As DNC communications director Mo Elleithee noted, "Isn't this what he's been doing all along? I don't know what the difference is between 'thinking about running and 'actively exploring' running, but I suspect it has a lot to do with keeping his name in the news." In fact Bush established not an exploratory committee but a leadership PAC and a super PAC, and he remained not a candidate until his announcement six months later on June 15. Many of the candidates followed some variation of this approach. Without filing with the Federal Election Commission, an individual can engage in very limited testing the waters activities such as "conducting a poll, telephone calls, and travel" for the purpose of determining whether he or she should become a candidate (1, 2). Although there is normally a $5,000 threshold that triggers candidate registration with the FEC, individuals can continue in "testing the waters" mode without becoming candidates provided they do not cross certain boundaries, such as referring to themselves as candidates or raising more money than is reasonably needed. If the individual does become a candidate, activities in the testing the waters period must be reported. Some candidates have a tendency to draw the announcement out and try to milk as much publicity out of it as possible. For example a pre-candidate may appear on a talk show or late night program, drop the news that he or she plans to establish an exploratory committee, then some days or weeks later get a bit more news by actually establishing an exploratory committee, and then still later on formally announce that he or she is a full-fledged candidate. A hopeful may choose to formally launch his candidacy with a announcement speech (+). In a symbolic location, surrounded by family and cheering supporters, the candidate outlines the themes that he or she will call upon repeatedly during the course of the campaign. Candidates usually do an extensive round of media appearances in conjunction with their announcements. Many candidates will do an announcement tour, delivering the same or similar speeches at stops in key states. There is no requirement that a candidate do any kind of announcement event, but it is a nice way to set out the tone and objectives of a campaign. The problem with a big announcement event is the attention only lasts for one news cycle. Thus some candidates opt to forego the expense and trouble of a formal announcement event and simply announce their campaigns in media appearances or via web video. A couple of the Democrats did two-step announcements. Sen. Bernie Sanders (I-VT) made a low-key announcement on April 30, 2015 and held a formal announcement event on May 26. Former Sec. of State Hillary Clinton announced via video on April 12 and held an announcement event on June 13. In addition to those who enter the race, there are those who decide not to run. One can recall a number of examples of potential candidates who came quite close to entering the race before pulling the plug. Most famously in Dec. 1991 then-Gov. Mario Cuomo (D-NY) had a chartered plane ready to take him to New Hampshire before announcing that he would not run due to the demands of governing New York. Then- Sen. Evan Bayh (D-IN) filed to establish an exploratory committee on Dec. 5, 2006, but his effort only lasted until Dec. 16. In the 2012 cycle Gov. Haley Barbour (R-MS) looked set to run, before announcing in late April 2011 that he would not be a candidate. This cycle, former Gov. Mitt Romney appeared to be tempted to make a third run before finally ruling it out on Jan. 30, 2015. Seemingly every presidential cycle, there is discussion about the possibility that a credible independent candidate could emerge, but by the end of the primary season it never happens. In 2011 the group Americans Elect set a goal of achieving ballot status in all 50 states; it aimed to "nominate a nonpartisan ticket that puts country before party, and American interests before special interests." The effort showed promise but proved to be a fiasco (>). This cycle there was talk that Donald Trump could mount an independent effort if his campaign for the Republican nomination fell short. Former Sen. Jim Webb had a look at an independent run as did former Mayor Michael Bloomberg. The contacts and networks built up during the pre-campaign period provide a starting point for building campaign organizations. A large pool of talent is available from 2014 mid-term election campaigns. In addition to their national campaign teams, candidates must also build organizations in key states. Intense efforts and resources are focused on the four early states of Iowa, New Hampshire, Nevada and South Carolina, although some candidates' strategies may involve bypassing or emphasizing one or more of those states. Further bolstering the employment prospects of campaign operatives, super PACs supporting the various candidates also need talent for their operations. Central to this building phase is money. Before the first vote is cast in a caucus or primary, candidates engage in "the money primary" (+). They must bring in enough money to hire talent, open offices, sustain their organizations and spread their messages. Early money is particularly important, and campaigns seek to put the best possible spin on their early fundraising numbers. In particular second quarter 2015 reports, covering April 1-June 30 and due at the FEC on July 15, gave an early indication of how the campaigns are faring. Finance reports for the third quarter 2015, ending on September 30, will also be closely watched. In addition to considering how much a campaign has raised, it is also important to look at its "burn rate," or how much it is spending. [FEC-Odd Year Presidential Activity] The nominally independent super PACs have added another dimension to the money primary as they can raise and spend unlimited sums in support of a candidate. Besides soliciting donations at events, on-line, or via phone or mail, there are several other ways that campaigns can bring in money. Campaigns bring in a bit of money by selling merchandise. Sitting Senators or congressmen can start with a fundraising advantage for they have the ability to convert funds from their re-election committees to their presidential campaign committees. A wealthy candidate can also boost his or her campaign; in 2007-08 Mitt Romney made $44.7 million in contributions and loans to his campaign and Hillary Clinton lent $13.2 million to her campaign. Donald Trump is self financing his campaign. Ultimately, however, a campaign is probably better off if it can create enough enthusiasm so that the money pours in as it did with then Sen. Barack Obama's campaign in 2007-08 or with the "money bombs" that helped Rep. Ron Paul's efforts. Finally, for candidates who qualify by raising $5,000 in contributions of $250 each of 20 states and agree to spending limits, a voluntary system of partial public financing is still in place (>). Matching funds are made available starting in January of the presidential campaign year. In 2012 the overall spending limit was $54.7 million. Major party candidates with any chance at the nomination now routinely opt out of this system so as to be able to spend more than the limit. In 2012, only Buddy Roemer, Gary Johnson and Jill Stein participated. To attract money and talent, a candidate must convince the party activists and donors that he or she can wage a winning campaign. Endorsements are a key part of establishing credibility. In the first half of 1999, for example, then Gov. George W. Bush firmly established himself as the frontrunner by lining up far more endorsements of elected officials than any of the other contenders (>). Looking to 2016, a number of congressmen and Senators endorsed former Secretary of State Hillary Clinton even in the pre-campaign period, 2013-14 (>). Other ways to build credibility as a presidential candidate include major policy speeches and strong showings in straw polls. Campaigns highlight favorable media coverage, linking to it and forwarding it on as they seek to show growing support. Candidates also seek to differentiate themselves from the other candidates in the field. Meanwhile, pundits and media will tier-ize the candidates; top tier candidates will receive ample coverage, while lower tier candidates may have to struggle for attention and inclusion. Tiers are not fixed; candidates rise and fall based on their performances. For both parties, there are many "cattle shows" where some or many candidates speak to party, ideological or interest groups. Republicans have a number of events focused on conservatives and faith voters. Meanwhile Democrats seek to gain support from organized labor. Straw polls provide early organizing tests for the campaigns. For Republicans, one of the biggest such events of the pre-primary period in recent cycles had been the Republican Party of Iowa Straw Poll, held in Ames in August. However, on June 8, 2015 the Republican Party of Iowa’s State Central Committee voted to cancel the event. There are many other gatherings where activists have the opportunity to compare the candidates. Some are high profile, established events such as the American Conservative Union's Conservative Political Action Conference, regional Republican gatherings such as the Southern Republican Leadership Conference, the Faith & Freedom Coalition's Road to Majority and the Family Research Council's Values Voter Summit. There are also more exclusive, closed or limited press gatherings where half a dozen or candidates appear before smaller groups of opinion leaders and donors. Examples of such events include the Council for National Policy gathering in Tyson's Corner, Virginia in May and Mitt Romney's E2 Summit in Park City Utah in June. High stakes broadcast candidate forums and debates took place but, on the Republican side at least, there was not quite the multitude that occurred in 2011-12, when there were at least 20 televised forums and debates (+). At its Spring Meeting in May 2014, the RNC approved a rule establishing a Standing Committee on Presidential Primary Debates, which will sanction events, and at its Winter Meeting in Jan. 2015 the party announced nine sanctioned debates between Aug. 2015 and March 1, 2016 (+). There was considerable speculation about how the RNC would manage the debates with such a large field of candidates and potential candidates (+). FOX News, organizer of the first debate to be held August 6 in Cleveland, answered the question by setting a criterion that candidates must "place in the top 10 of an average of the five most recent national polls, as recognized by FOX News." There was some push back; for example a group of New Hampshire Republican leaders argued that "the proposed limitations are unnecessarily narrow and risk eliminating potentially viable candidates (+)." FOX then announced that prior to the primetime debate it would hold a candidate forum with nonqualifying candidates who reach a 1% threshhold in national polls. Seven candidates participated in what was dubbed the "kids' table" debate. (Countering the FOX debate, a Voters First Forum was held on August 3 in New Hampshire, but the candidates appeared individually (+). Meanwhile, the DNC announced (+) on May 5, 2015 that it wouldl sanction six debates starting in Fall 2015 "when voters are truly beginning to pay attention." Further, the DNC announced an exclusivity requirement wherein, "Any candidate or debate sponsor wishing to participate in DNC debates, must agree to participate exclusively in the DNC-sanctioned process." The first DNC-sanctioned debate occurred on October 13 in Nevada. Early on Sen. Bernie Sanders (I-VT) advocated for a larger number of debates as well as inter-party debates (+), but it was former Gov. Martin O'Malley who made the most efforts to push the DNC to increase the number of debates (+). To better mobilize supporters in key states, campaigns open state headquarters. State organizations line up support from activists and endorsements from county chairmen and elected officials. The ad campaigns also started. There were a few scattershot, targeted buys. First on the air was Cruz for President with the Easter weekend ad "Blessing" (April 3-5, 2015). Sen. Rand Paul's campaign went up with "Defeat The Washington Machine" on April 13. Other campaigns ran an occasional ad. The Clinton campaign started advertising on Aug. 4 and was on air fairly consistently from then on. The Right to Rise super PAC started its ad campaign on Sept. 15. But the real ad war involving those campaigns with enough resources to play did not fully engage until November. Campaigns: 2016 | 2012 | 2008 R, D | 2004 | 2000. By Fall 2015 media and public attention turned more and more to the four early states where a lucky few voters would finally have a say. While a successful campaign will have been focusing most of its attention on these early states, it will not have ignored other states. Endorsements by officials are a key building block of a state organization. Behind the scenes, a campaign must also lay the groundwork for qualifying for primary ballots. Each state has its own rules—some are tortuous, others expensive and others, like New Hampshire, are relatively straightforward. In November and December, filing deadlines start coming up in individual states. For example, New Hampshire statutes state, "Declarations of candidacy shall be filed between the first Monday in November and the third Friday in November, or during such other time period as the secretary of state shall announce." Campaigns must start line up full delegate slates, or they may run into problems later on. For some candidates, the months of planning and preparation, hard work and handshaking are not enough to make it to the starting line, let alone secure the party's nomination. Reality sets in, and it becomes impossible to continue without going into debt. On the Republican side, the Iowa Straw Poll had served as an important marker, where poor showings in the mega-event usually prompted one or two candidates to drop out. There was no Iowa Straw Poll this cycle; one commentator observed that Donald Trump's candidacy had the same winnowing effect. Thus on Sept. 11, 2015 former Gov. Rick Perry (R-TX) whose campaign had been hurting financially, became the first candidate to bow out of the race (+) and several others followed. A candidate may give a speech upon leaving the race or more often may just do it by issuing a statement or video. If there is an event, emotions are high and a few tears may be shed as the candidate, surrounded by family and staff, announces the end of his or her quest. The speech can offer initial insights into what the candidate feels he or she accomplished and why he or she failed to gain more support. The candidate may also take this opportunity to throw his or her support to one of the remaining contenders. Jennifer Jacobs. "Iowa caucuses: 50 most wanted Republicans" and "Iowa caucuses: 50 most wanted Democrats." Des Moines Register, Dec. 22, 2014. John DiStaso. "Attention presidential candidates: NH Journal’s top 60 ‘most wanted’ Republicans" and "Here’s our top 60-plus ‘most wanted’ NH Democrats for the 2016 presidential campaign" NHJournal, Dec. 23, 2014.